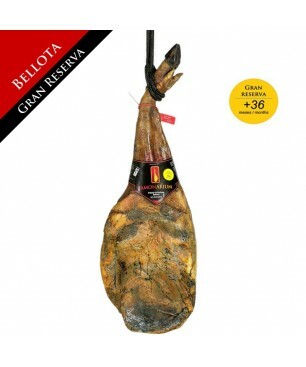 Bellota Iberian shoulder ham "Gran Reserva 2015-16"
Iberian Bellota Spanish shoulder ham "Gran Reserva," is a special shoulder ham because of its 34months of curing time and its great size, from 5.5 kg. High performance shoulder ham. The result is spectacular marbelled iberico shoulder. Strong taste and intens flavour.Limited production. The sliced Iberian Bellota Spanish ham is presented in thin slices and vacuum-packed in 100gr sachets. This is the easiest way to eat a delicious ham. It can be stored up to 6 months in the fridge or in a cool place. Intense flavour and an incredible aroma.Sold in a 100gr sachet. Piece of Bellota Iberico Spanish ham (boneless) - Bottom piece, "la punta"
Iberian Bellota shoulder ham sliced is the front leg of the iberian pig, free-ranged and feed with acorns. It is sliced and vacuum-packed in 100gr packs right after ordering it, for preservation reasons. Plenty of flavour and scent, it is ready to serve anywhere, any time. Easy-opening packs. High proteins content. 100% mediterranean diet. Whole Spanish iberian Bellota ham, boned and cut into slices. Comfortable and ideal format to avoid having to cut, just open the bag and serve it! The best ham you can eat. The whole sliced ham consists of: 25 bags of sliced ham (100 gr.) 1 pack of chips, rest of ham near the bone (150 gr.) Bonne vaccumm packed. The boneless Iberian Bellota Spanish shoulder ham "Gran Reserva" is the best option to enjoy at home the best iberian pata negra bellota shoulder ham with no bone nor fat. Easy to cut, easy to store. Intense flavour and an unmatched, incredible aroma with small pink fat layers which helps appreciate better the fabulous texture of this masterpiece. Whole Bellota iberian shoulder ham cut into slices. Comfortable and ideal format to avoid having to cut, just open the bag and eat! The whole sliced shoulder ham consists of: 15 bags of sliced ham (100 gr.) 1 pack of chips, rest of ham near the bone (150 gr.) Bonne vaccumm packed. Whole Bellota Spanish iberian ham "Gran Reserva", boned and cut into slices. Comfortable and ideal format to avoid having to cut, just open the bag and serve it! The best ham you can eat. The whole sliced shoulder ham consists of: 35 bags of sliced ham (100 gr.) 1 pack of chips, rest of ham near the bone (150 gr.) Bonne vaccumm packed.